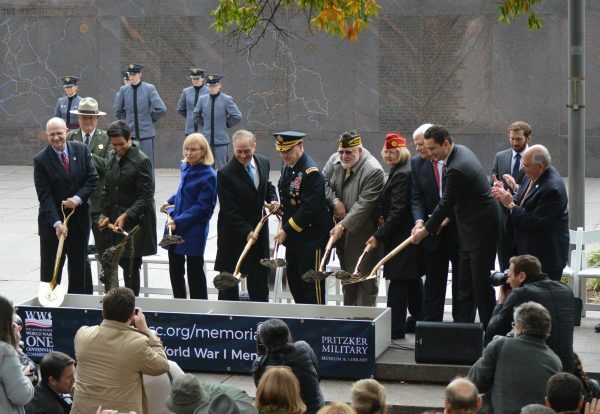 In an act which many Americans feel is long overdue, almost 300 people joined members of the U.S. World War I Centennial Commission yesterday, as it hosted a ceremonial groundbreaking for a World War I Memorial in Washington, D.C. The new memorial will be erected on the southeast side of the White House, on the parcel of land known as Pershing Park. The event was a flourish of sights and sounds. 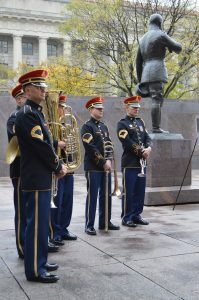 Participants included a host of U.S. Military Academy Cadets, the Pershing Rifles Group, and the U.S. Army Band’s “Pershing’s Own” Brass Quintet, and over a dozen World War I living-history reenactors. Attendees included a host of notable military and veteran leaders, as well as Centennial Commission members, notable members of the historical/cultural community, U.S. and city officials, and major donors. Also on hand were military representatives from many of America’s allies during World War I. As a backdrop in Pershing Park, the National World War I Museum and Memorial in Kansas City, provided “Fields of Battle, Lands of Peace “, a special traveling exhibit of art photographs taken at the battlefields of France and Belgium, telling the story of America’s doughboys in the war. The “Fields of Battle, Lands of Peace” exhibit will remain for viewing in Pershing Park until December 8th. For the ceremonial groundbreaking, the keynote speakers used presentation-shovels to turn soil transported from the Meuse-Argonne battlefield in France. Meuse-Argonne was the site of the largest military battle in the history of the United States military and involved over one million service-members. Twenty-six thousand Americans were lost in the battle. 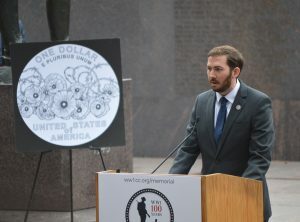 The Centennial Commission also used the event to announce that they had received leadership gifts from two of America’s leading veteran service organizations, the American Legion, and the Veterans of Foreign Wars. Each of the organizations made donations in the amount of $300,000, to be used for the creation of the new national-level memorial. “They are gone now,” added American Legion National Commander Denise Rohan, “but their legacy endures. It was not the war to end all wars, but oh, how we wish it were. How we wish that those 116,516 fallen American heros were the last to die in war. Once completed, the new memorial will come under the auspices of the National Park Service.